I love using emojis in my texts, to the point where sometimes I even start to think in emoji. I know it’s weird, but that’s me. You know that emoji where the eyes are two straight lines and the mouth is also a straight line? That’s how I feel after reading the Gospel today. The face of “Yes, I know. And I know better. And yet . . . .” Grim recognition? That might be the phrase I’m looking for. I really like when people agree with me. I don’t like feeling challenged, I don’t like feeling wrong, and I absolutely do not like being judged. But judging other people? I got skills upon skills when it comes to judging other people. For example. And I am not proud of this example: I was at my Holy Hour, in Adoration, and the man in front of me was wearing a super oddball t-shirt. I had a few thoughts about this tee. Here I was, sitting in front of Jesus, and instead of gazing upon Him in His Glory, I spent a few minutes judging someone’s shirt. The shirt of a man with whom I share my Holy Hour, week in, week out. Someone who kneels side-by-side with me in front of the Risen Christ for an hour. And I knelt there judging the text on his t-shirt. I had to march myself into Reconciliation and confess that, which honestly was just embarrassing. Here’s the thing, though: These judgments are just as bad when I am making them on the bus, in my classroom, at family holidays (yes, I’ve done that, too). God knows, even when I am not doing it in directly in front of His mystical body. When I am judged by the judgment I pronounce? That will be tough for me if I keep going the way I have gone for the last couple decades of my life. I need to spend more time with Jesus, sitting in Adoration, and not worrying about the speck in anyone else’s eye. 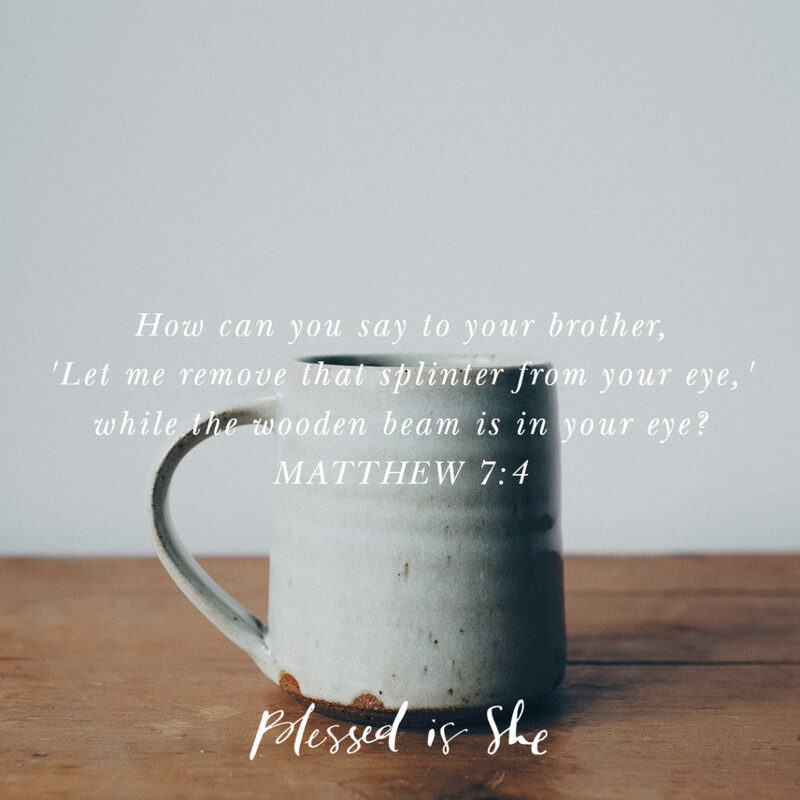 Instead, fueled by the the grace we receive from partaking in the Sacraments, I need to work on getting that log out of my own. Is there a log in your eye that you’re ignoring? Look on the places in your life where you feel a bit of grim recognition. It’s true we are not to judge one another’s hearts – but we as Christians are called to judge one another’s (Christians) actions and gently with love and prayer asking the Holy Spirit for the words to tell them if their actions are leading their soul into danger. Judging an action right or wrong is different than judging a person’s motivations (their heart). We should love one another enough that we care more about our souls salvation than how they might view us. Jesus tells us if our brother is sinning go to him and tell him and if he doesn’t listen get two or more to go with you and if he still doesn’t listen bring in a priest to talk with him. We are called to do this gently, and with love and mercy not with judgement of condemnation of their souls. Love the sinner but not the sin.